As I’m typing this post, this is what we’re having for dinner tonight! Cook chicken slices in separate pan – approx 7 minutes or until done. Set aside. 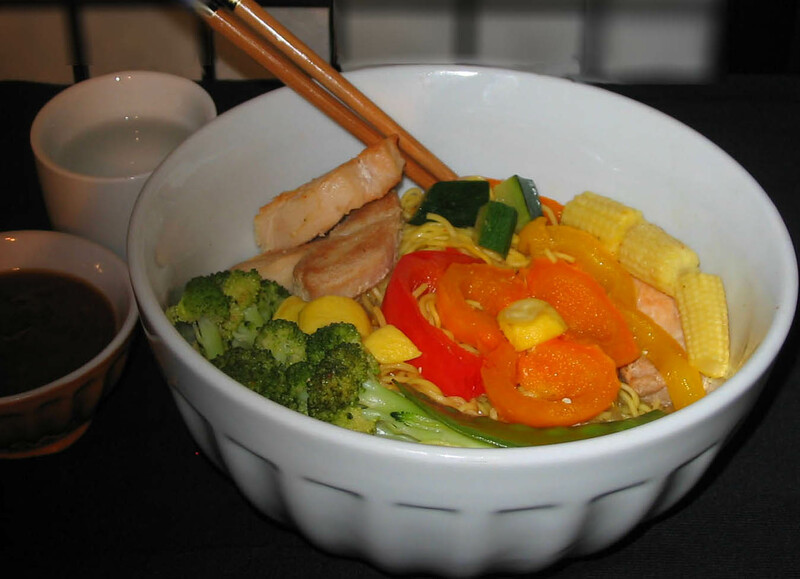 Find a big serving bowl, place noodles in bottom and veggies & chicken on top. From beginning to end, this clocked in at 22 minutes. Vegetarian Option: This dish is just as good without the chicken, and using vegetable bouillon instead of chicken stock. I remember the first time I tasted steamed chow mein noodles – I had no idea what it was, but boy was it good! My little 5’2 Philipina friend Ophelia introduced this scrumptious dish at a pot “blessing” as my friend Sharon says. We’re a small group of both gals & hubbies of all backgrounds, ages, sizes and demographics yet we’re such a community, and at the time … in the middle of the big city no less. Anyone that had too many of something, would always share with the others without and vice versa. Just goes to show, it’s the spirit of the group that makes the dynamic special, not necessarily the location. This favorite dish has been refined and re-refined to the pallets of our household. There never was, really an original recipe, it was the “rummage through the fridge see what’s in there” recipe. One night, I measured out how much I used of each, and presto! here it is. The secret to this recipe is the fresh garlic & vidalia onion. It’s the foundation of the whole blending of flavours for the recipe. If you can get the garlic at the farmer’s market, even better. Once you’ve grown your own, you’d be hard pressed (pardon the pun) to go back. OH! and fellow Canadians, if you’ve tried a “certain chalet chicken place” this summer, you’ll LOVE the spinach salad recipe below! TIP: to gague quantity of dressing, when the salad is in the mixing bowl, pour the dressing around the in-side of the bowl. That will be enough dressing for that salad. From beginning to end this recipe clocked in at 5 min. If using salad as a meal, add pre-cooked Lillydale Brand chicken slices – it makes an amazing ultra-fast light dinner or lunch (the girls at work will be jealous) Just dress at the office… ahem… I mean, dress the salad at the office. Steamed noodles can be purchased fresh & put in the freeze when you get home. Add 5 min to the cooking time, and still get the great taste of a fresh noodle!